harm done, the Sector works either way, but I apologize for any confusion. refer back to them later. by moving the mouse cursor over it, and delete it by hitting the Delete key. mark it. When you have a single Line selected, editing it works just fine. Type to 7 - -2/5% health (acid floor). Change the floor texture to NUKAGE1. "Nuke Waste Pit" is done. Try it out. But don't stay in the pit too long! placed. Fig. 5 also shows how each set of 4 Vertices is made into a new Sector. higher than the previous Sector. (Fig. 5 also shows these floor heights). Give each Sector a ceiling height of 128.
textures (where you walk through). That should be it for the stairway! run BSP on every map I make, and I ALWAYS save the old file as a backup. result should be something like Figure 6 of DEUGP4B.PCX. west walls are Impassable, with normal textures of STARTAN3. This is fine. window, you would turn to stone and be damned forever. window, a "courtyard" Sector, so that there is something to see outside. up against the south edge of our window (See Figure 7 of DEUGP4B.PCX). you REALLY want to avoid is having two Lines in the exact same place. order in which you mark stuff. The correct order would be 1-2-3-0.
trouble with this, you might want to try adding in new Lines one at a time. a good clue that something is wrong with a Line (no Sector refs, etc.). same exact place, and that you don't have two Sectors in the same place. main menu, and then edit the level again, the Sector will then be selectable. You also want to be sure that you don't have Lines or Sectors that overlap. experimenting to learn all about those features (ya hear that Wraith?). files I've collected, and also lets me pick which ones to load into DOOM. The program will be called "WAD Runner", look for it sometime soon. 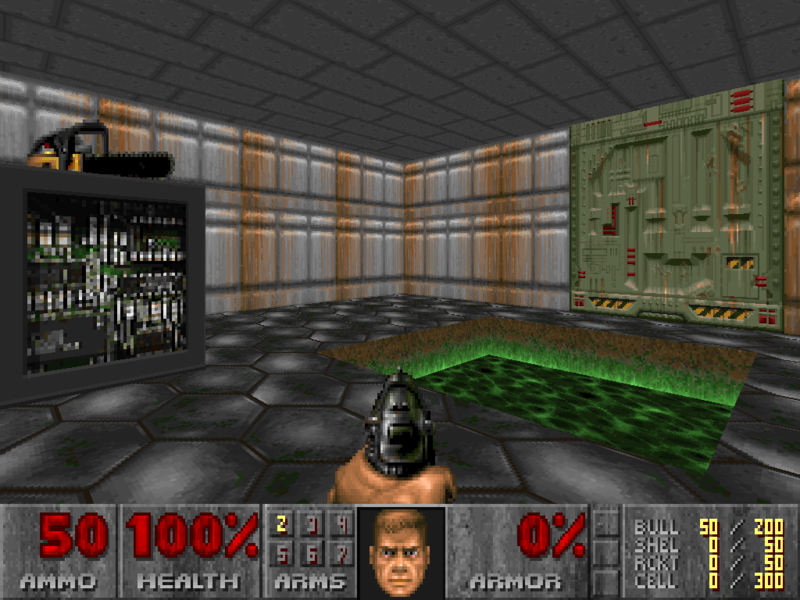 DOOM is a trademark of, and is copyright (c) 1993 by id Software, Inc.